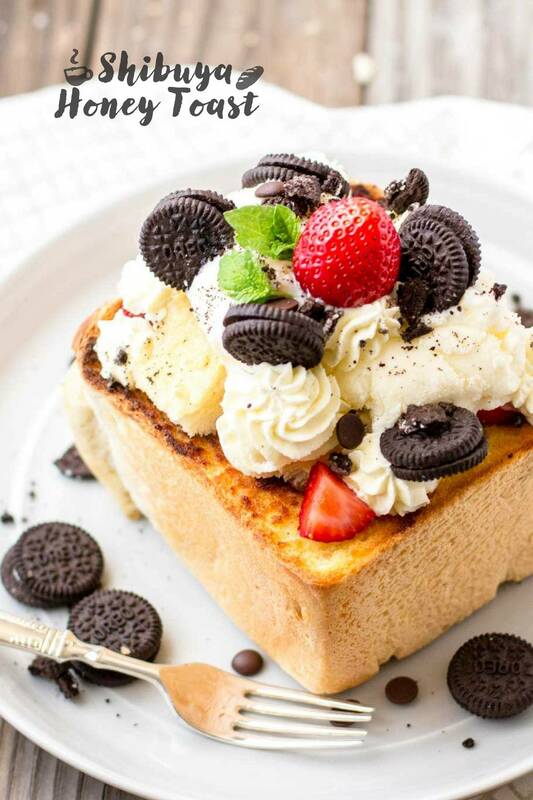 Shibuya honey toast is Japanese decadent creation of brick toast! 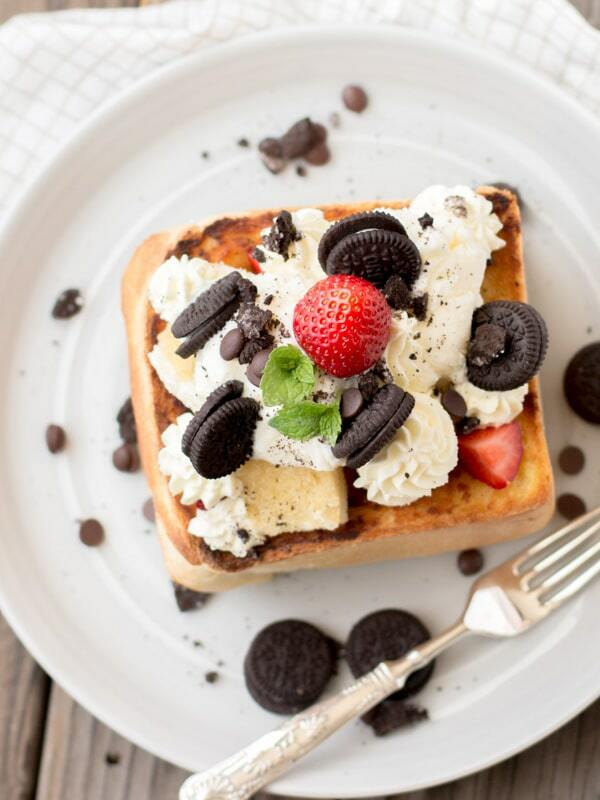 Creamy vanilla ice-cream, mini Oreos, sweet strawberries, and chocolate chips all topped on a delicious crispy honey-coated toast block filled with warm, soft honey toast bites! Sounds and looks super extravagant and laborious but it’s incredibly simple and quick! There’s no need to spend hours slaving away trying to impress people by making some complicated dessert like soufflé or a meringue pie that might end up failing, just make this honey-toast! 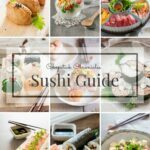 Everyone will love it and you’ll only have spent 15 minutes or less making it; it’s a win-win situation! 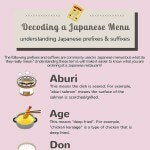 This amazing dessert originated in the Shibuya (duh!) district of Tokyo and has become super popular all around the world (especially in countries like Thailand and Singapore). And it’s no surprise why! 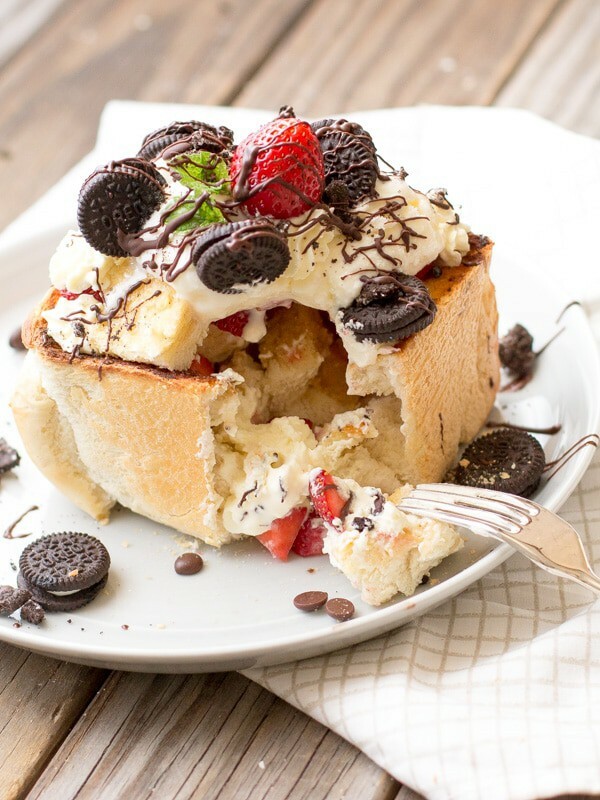 The honey-coated outer side of the bread is crunchy while the inside is warm and soft; then add delicious toppings like ice-cream, strawberries, whipped cream, Oreos, and chocolate chips and drizzle it with smooth milk chocolate and it becomes an incredibly mouth-watering decadent dessert. After that first bite it’ll be very clear to you why this bread is loved by everyone, everywhere. 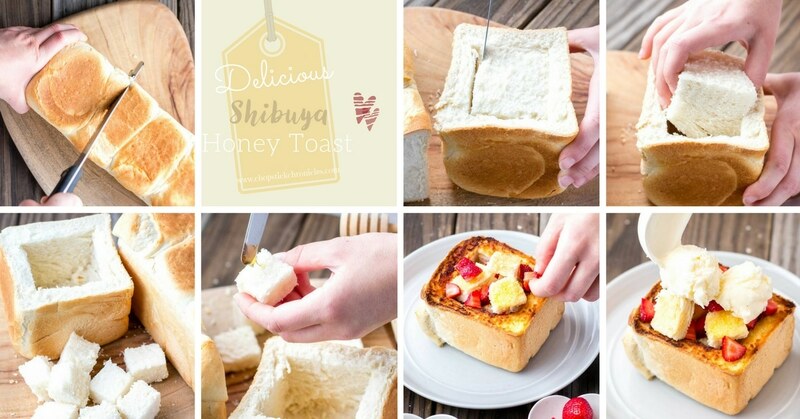 One of the plus sides to this amazing Shibuya Honey Toast is that it is deceptively simple to make! Because it looks so decadent and extravagant everyone will think you put a lot of time and effort into making it but in reality, it’ll take you about 5 minutes (plus the baking time for the toast, which is only 10 minutes). All you have to do is chop an end chunk off a block of bread, cut out and cube the inside, coat it in honey, bake it to make it slightly crispy, then top it with whatever you want! Forget actually taking hours to bake some crazy layered cake or a perfect crumble for dessert, serve this up instead and just make people believe you did. Everyone will be super impressed with all your “effort” and with the delicious flavour. 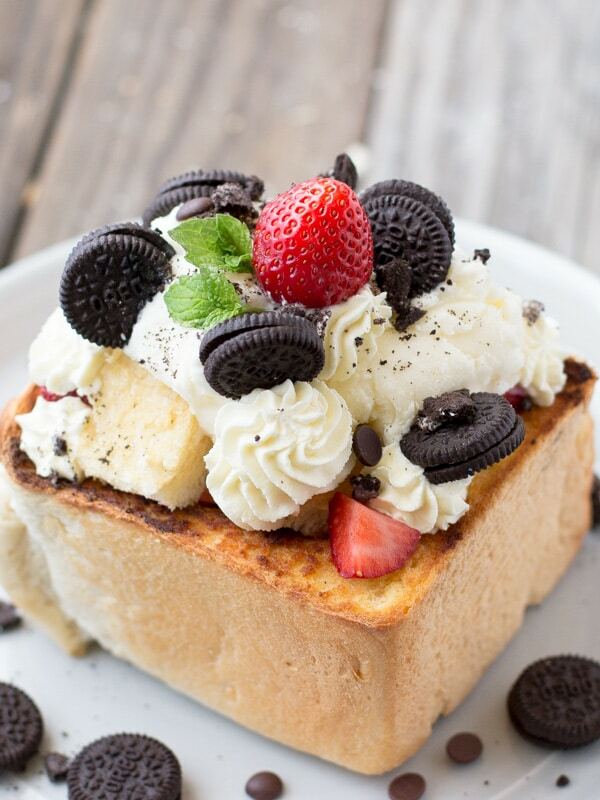 Another great thing about the honey toast is that it’s super versatile; you can put absolutely whatever you like on it! 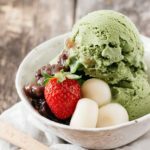 Switch the vanilla ice-cream I used for a chocolate, strawberry, espresso, mint, or hazelnut flavoured ice-cream. Change the Oreos to choc-chip cookies, chunks of chopped up Twix or Mars Bars, M & M’s, or Reece’s Pieces. Use bananas, or pear, or apple instead of strawberries. You can do anything! The possibilities are virtually endless! I’m even thinking of making a savoury version with some ham and cheese, so stay tuned for that; and first just enjoy making and eating this sweet version! Preheat oven to 180 (356f). Chop off a large chunk of the end of the bread loaf. Cut out a square of the inside bread of the chunk and gently pull the square out of the inside. Chop the pulled-out square into small bite-sized cubes. Line a baking tray with baking paper and lightly coat the inside of the bread chunk and the bite-sized cubes with the butter and honey and place them on the tray. Bake in the oven for about 10 minutes or until slightly brown and crispy. Take out of the oven and allow it to cool. 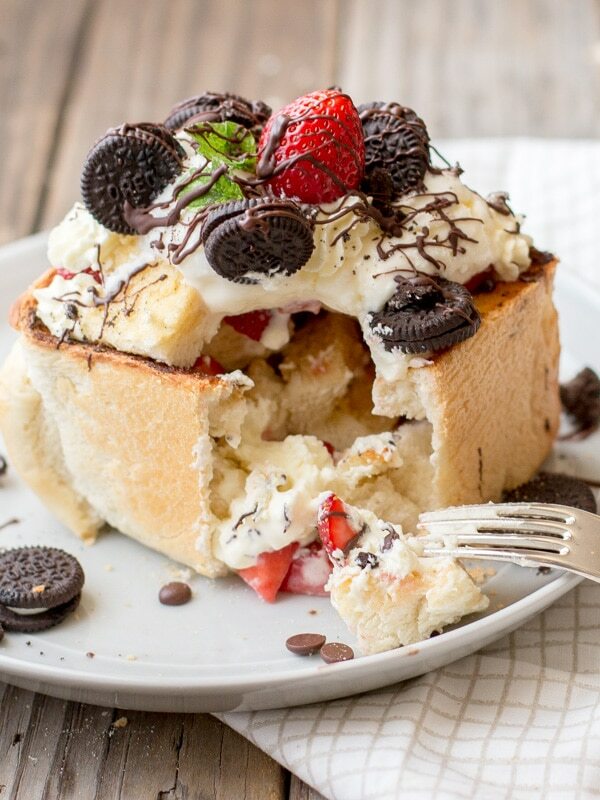 Fill the bread chunk with the bread cubes and chopped strawberries. Top with ice-cream, whipped cream, Oreos, strawberries, chocolate chips, crushed Oreos, and drizzle with milk chocolate. The toppings are suggestions only. Nutrition value is calculated on the above mentioned ingredients. If you alter the ingredients, nutritional value will differ. I have always wanted to try this. My friends in Asia keep posting pictures of their pretty toast bricks. It makes me sad that I can never try it. Now, I can totally make my own. Thanks so much for sharing! Yours look absolutely gorgeous, and I’m sure it is delicious! Yeah you can definitely make your own, it’s sooooo easy!!! Thank you very much! Thank you Joleen 😀 where do you live? Are you in Tokyo now? what a wonderful idea to have at breakfast! Definitely looks like a must try!